Deer are major hazards to drivers. You see the ghastly results of these collisions on the side of the road each day, but most drivers still don’t pay attention to these potentially dangerous critters. Its pretty clear that an animal that willingly leaps into traffic and then comes to a halt in the path of a vehicle barreling down the highway isnt the most intelligent being, but a lack of intelligence doesnt mean these woodland creatures arent dangerous. A deer can go from invisible to road obstacle with one bound from behind a bush, causing immediate danger to itself and, more importantly, a driver. Learn how to avoid an accident with a deer with a few tips from Quirk Pre-Owned, one of the leading used car dealers in Massachusetts. Though deer do pose a threat to drivers, that doesnt mean you have to white-knuckle the wheel in anticipation of one of these forest friends darting in front of your car. Just like most potential road dangers, preparation goes a long way. Making sure you know how to react the moment you are faced with this situation will eliminate any rash decisions and leave you to drive in peace. According to the Insurance Information Institute, you should be on the lookout for multiple deer, rather than just one. Deer are herding animals, so they are most likely to be found in groups. Making the mistake of focusing on just one deer grazing on the side of the road is a big mistake indeed, for your more likely to miss its friends nearby that may be more tempted to jump into traffic. Deer are most active from 6pm to 9pm. This also happens to coincide with the rush-hour traffic at the end of the work day. Be aware during this time and follow the speed limit. Its much more difficult to react safely to a deer-crossing when you are traveling at higher speeds. So, slow down and give yourself time to judge and react appropriately to the situation; this will keep you and your car out of harms way and send Bambi back into the thicket. 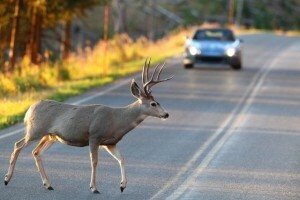 Vehicle-deer collisions can be deadly for the people in the car and the deer. Taking just a few extra precautions each day will decrease your risk of getting into these accidents and let all road-travelers live in harmony. Check out Quirk Pre-Owned, one of the leading Massachusetts used car dealers, to learn more safe driving tips and to test-drive our exceptional used cars.